In today’s video we’ll talk about the history of the song, how it’s been used in pop culture, some thoughts of why it’s famous, and, of course, a musical analysis. Even if you’re not very familiar with classical music, you should be able to follow this analysis. I like doing these videos so that anyone can watch, not just music snobs. Chopin’s Nocturne in E flat major, op. 9, no. 2, was composed between 1830-1832, when Chopin was around 20 years old. He dedicated his op. 9 nocturnes, a set of 3, to Maria Pleyel, the wife of an acquaintance of Chopin’s. Chopin was Maria’s piano teacher, and he dedicated many of his works to students. Before we talk too many other details, I want you to listen to a few moments of this nocturne, so you have a general idea of what we’ll be talking about. Nocturne op. 9 no. 2 is an extremely famous tune, and you’ve probably heard it at one point or other in your life. It isn’t one of Chopin’s extremely difficult pieces either; it’s playable at a grade 9 level RCM. Of course, since this piece is so famous, it has also been overplayed and badly performed many times – sort of like Stairway to Heaven if you’re a guitar player, or Fur Elise by Beethoven as another piano example. Some people avoid very famous pieces because they are so overplayed, but I actually think that makes them especially worth knowing – obviously there’s something to them, if they’re so popular. Even though Chopin revolutionized the genre of Nocturnes, he owes a lot to John Field, an Irish composer who wrote nocturnes before him. Chopin regularly taught his own music to students, and one of his students, Wilhelm von Lenz, recalls how Chopin was extremely picky about this piece. No one could play it as good as him. Wilhelm said, “You play it so beautifully…can no one else?” Chopin replied, “Liszt can”. Chopin’s nocturne in E flat major has made its way into many movies and TV shows, such as The Five Year Engagement, Bones, Dexter, Mad Men, Hannibal (the series) and the Simpsons. A lot of times, this nocturne plays while a character reminisces or has deep thoughts. At its best, this nocturne op. 9 no. 2 radiates a certain coolness and detachment. It’s crisp, it’s clear, it just gets you. Like that sharp, intellectual world traveler friend who always has useful insight on your life. At its worst, this nocturne is sloppy and overly sentimental. It’s like that drunk friend who is trying to explain their feelings, but mainly saying, “I love you so muuuuuuch” a bunch of times. The same song, depending how you play it, can have two completely different effects. The tendency with Chopin’s tender music is to really just get into it and pour out your heart, but his music is best performed with an air of quiet reservation. You could pour out your heart, but it sounds better – and is more interesting – to hold back a little. I want you to pay attention to that as we listen through some clips of the song. Someone online said this (I forget who), but it’s great – Chopin was a master at reaching the fine line separating drama and melodrama. Pay attention to its subtleties and nuances, and notice how it could – but doesn’t – go over the top. So first of all, we’ll talk about the song form of Nocturne op. 9 no. 2 – the overarching structure of the piece – and then we’ll go in and listen to some examples. A, A, B, A, B, A, coda. But all 4 A sections aren’t identical – they become more ornamented and elaborate with each passage (same with the B section). 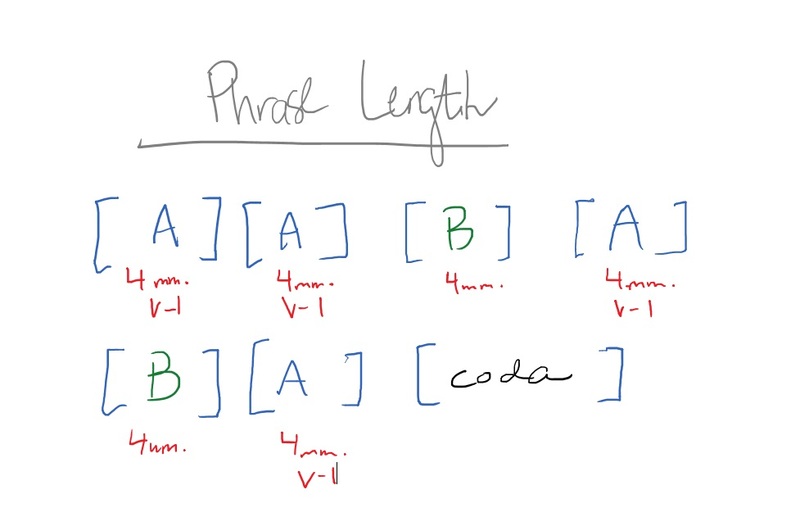 And the coda just means “ending”. The mood of this piece is tender and reflective right up until the coda, where there’s a passionate burst of octaves and a brief fortissimo. 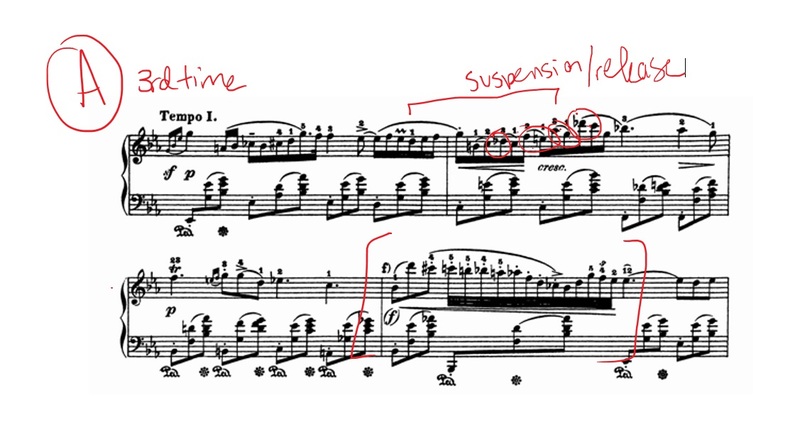 But it’s over almost as soon as it begins – Chopin doesn’t linger with the climax, showing us again that he was a huge believer in “less is more”. We’ve already listened to the opening measures of this nocturne, which is the A section. The first time we hear this melody, it’s very bare-bones and unembellished. In future repetitions, the melody becomes increasingly chromatic, and these chromatic notes add a feeling of anticipation, like you’re trying to reach something. Let’s take a listen to the second A section, which occurs immediately after the first. The chromatic tune really tugs at us listeners. There’s this melancholic thread running through this entire piece, but instead of sounding lethargic (as melancholic songs can do), it really pulls us and creates suspense. Literally he uses a lot of suspended notes. 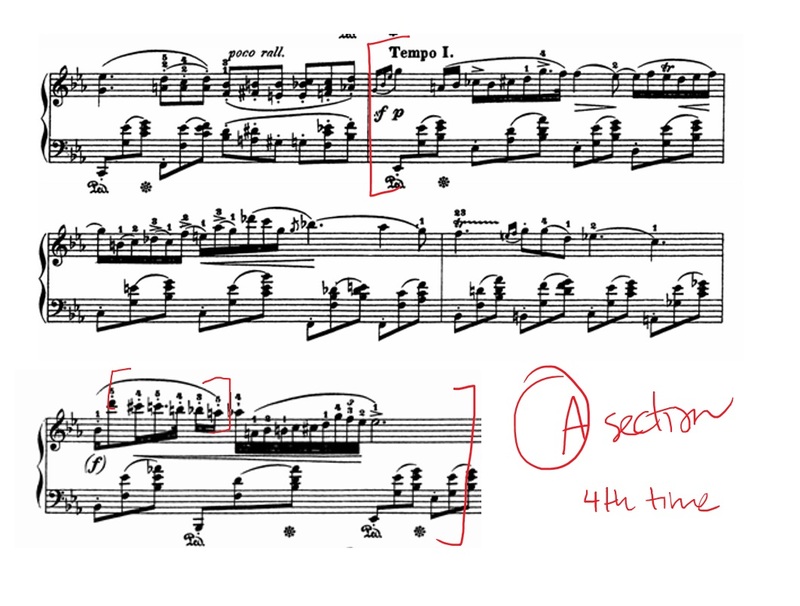 The third time the A section comes around, after the B section, the main change/embellishment is the descending waterfall of notes – suddenly there are many more notes. The whole section is a little more forceful, too – but just a little. The final time we here the A section, it is virtually identical as the previous time, save for the little end pattern, the descending waterfall-y part. This time there’s a prolonged set of shorter, staccato notes, then a sudden burst of 32nd notes. One thing that’s fun about this nocturne is how symmetrical it is. The entire piece is built on 4-bar phrases. The A section is 4 measures, the B section is 4 measures, everything is 4 measures until you get to the coda. Not only that, but Chopin uses proper cadences to end his phrases. Bb7 – Eb, or V7 – I. This is called a perfect cadence, and it gives us a very satisfying “end” feeling, kind of like when you reach the end of a paragraph in a book. If you think about this from the vantage point of pop music, it’s like how common it is for verses or choruses to be written in sets of 4. Like maybe it’s 4 chords that repeat, or the lyrics for the chorus are four lines – once you start looking, you’ll notice so many songs written in fours. Chopin was a rule-breaker, but sometimes he broke rules by staying within them. In the A sections, he’s writing – sort of – conventionally. He’s got 4-bar phrases that end in a perfect cadence. He takes this tried-and-true song structure, and makes it entirely his own with little tweaks. 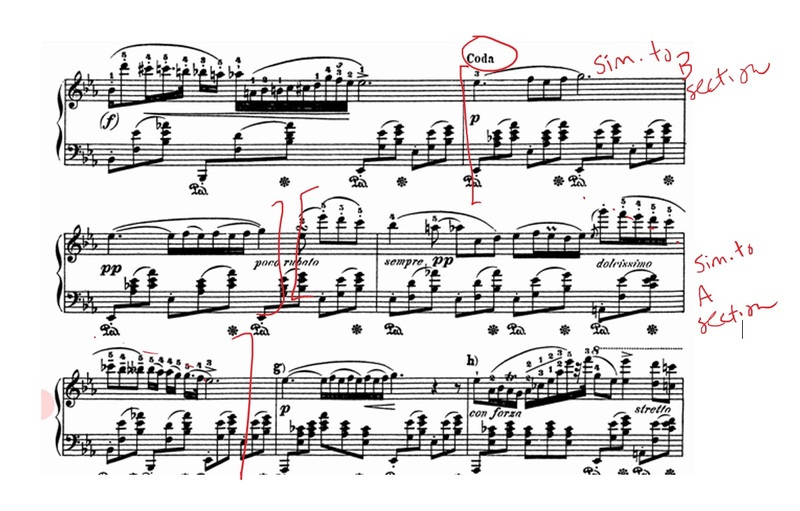 If Chopin plays by the rules in the A section, the B section is when he lets his hair down. Not in the way you might expect – it doesn’t sound wild or crazy. It sounds very simple and elegant. But we go on quite the modulation journey here (modulation is where the sound of the “home key” shifts. Since this song is in Eb major, Eb is the “home key”). We go on this fun journey that somehow, masterfully, leaves us in the key of C minor for a moment. But then, he gives us a chord pattern – F to Bb, another V-I progression, and the brief dark mood passes. Next, we have an exciting chromatic journey! All of the notes are headed downward in small chromatic steps, until we wind up on that very last chord, a Bb7 – which is the perfect lead-in to the key of Eb major (V-I again). 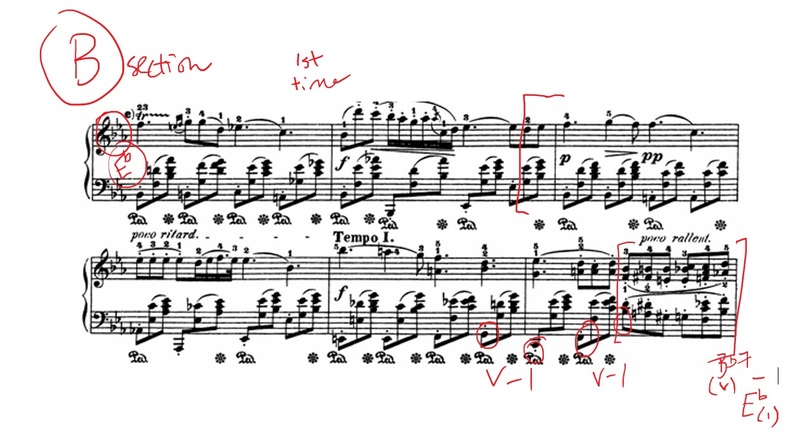 And since this part immediately precedes the return of the A section, this is how Chopin manages to have all these modulations and weird chromatic notes –by connecting the end of the B section with the beginning of the A – by his choice of chords. The first part of the coda has echoes of the B section, in its harmony and simplicity. After that, we see an echo of the A section – the descending line that concludes all the A section is seen here (but altered), with that V-I pattern tying things up nicely. 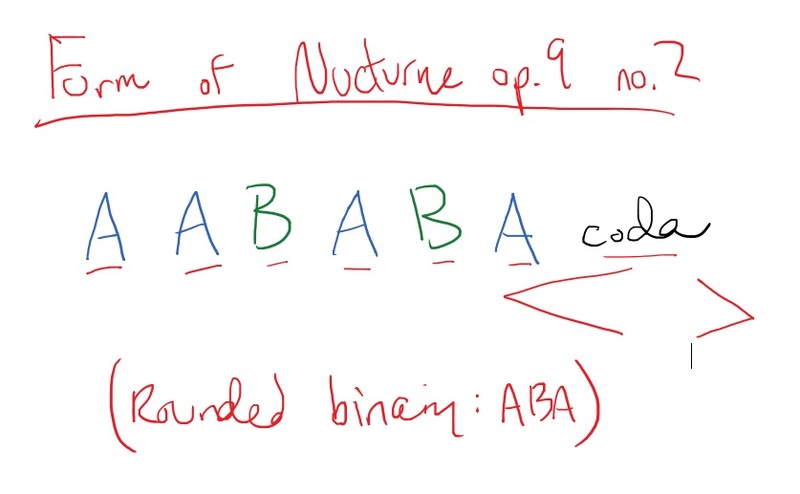 Let’s take a listen – see if you can hear the similarities of the A and B sections in this first bit of coda. We start off with a quiet, embellished version of the start of the coda, but things quickly shift as we see “con forza” with force, a big upward leap to the highest note of the piece yet, and some big octaves for extra oomph. 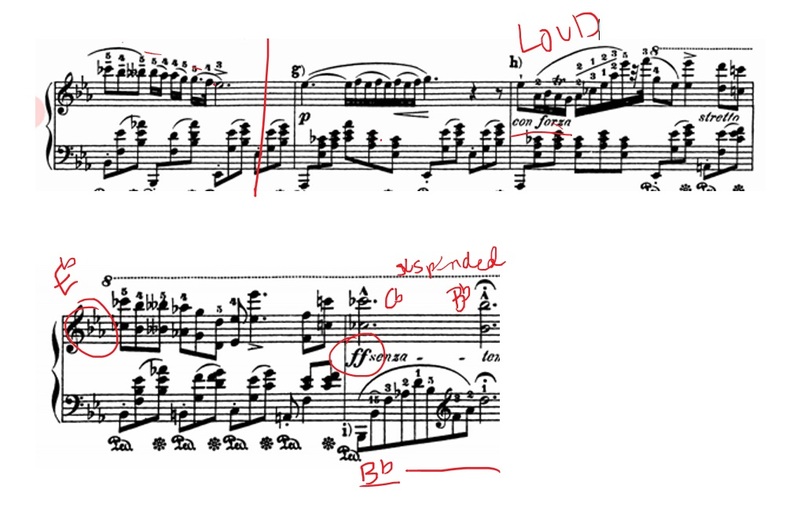 This loud section gets even louder with “ff”, and Chopin tugs us with a long, suspended right hand octave (Cb to Bb) over a Bb7 harmony in the left hand. Remember, since this song is in Eb major, Bb major is our “dominant” or “V” chord – it has the second strongest sound (Eb is the strongest). But the dominant chord creates tension and a feeling of “we’re not finished yet”, which you’ll hear when you listen to a clip of this part. 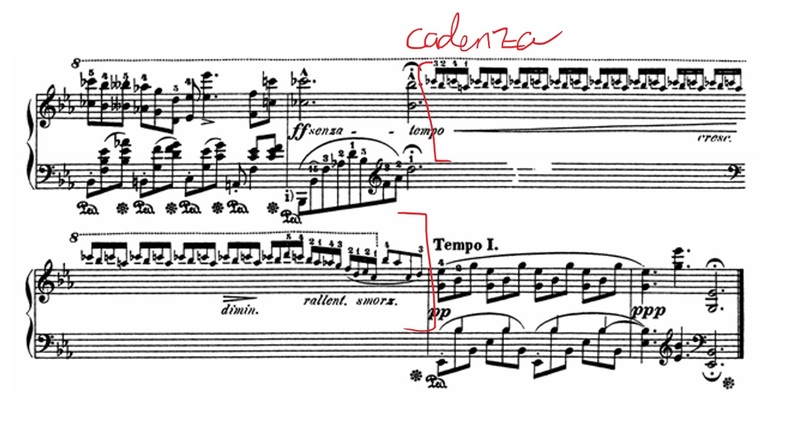 For this little mini-cadenza, Chopin creates a haunting effect with mainly four notes repeated over and over again. He could have done this big sweeping cadenza and make the ending really dramatic, but as you have probably come to expect, Chopin understates things again, keeping everything contained. There’s just a little drama in this cadenza, but a little is just the right amount. Any more would have been too decadent and would overwhelm this delicate piece. 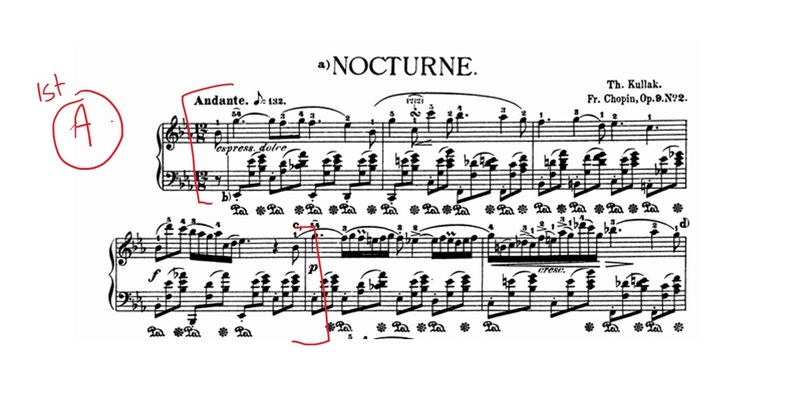 And that concludes our discussion on Chopin’s most famous piece – his Nocturne op. 9 no. 2. I hope you enjoyed today’s video/blog post, and that you got something new out of it. Thanks for stopping by, and I’ll catch you next time!